Marion Holiday Park offers the complete holiday experience with resort accommodation, lush tropical gardens and world-class facilities. This family-friendly resort is the perfect getaway from the city without leaving the city at all. All the features of a tropical resort including 45m Lagoon Pool, Waterpark, Indoor Heated Pool, Jumping Pillow, Adventure Playground, Games Room, Indoor Tennis Court and Poolside Bar & Beer Garden with Outdoor Cinema. 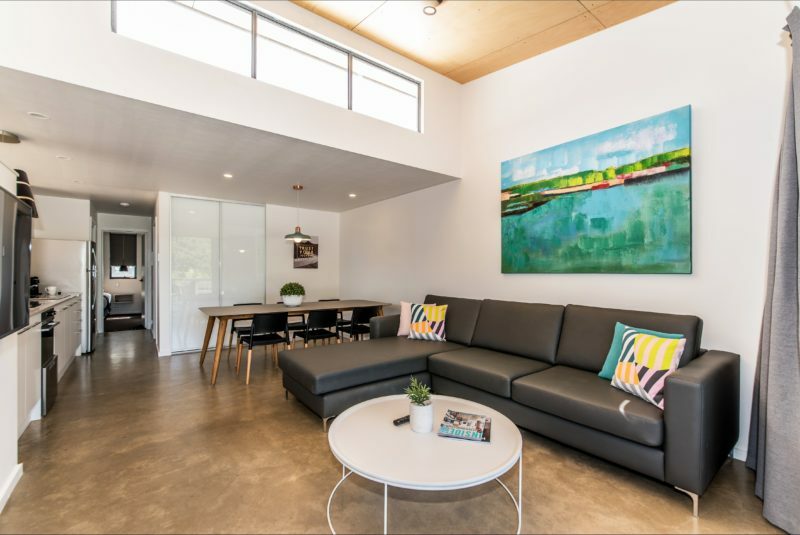 Providing a range of accommodation and powered sites from luxury Poolside Apartments and Lagoon Units to Creekside Villas, Retreats, and Bungalows, you’ll be sure to find something that suits your needs. 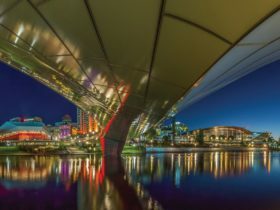 Only 12 kilometres south of Adelaide CBD, Marion Holiday Park is close to the Southern Vale Wineries, Adelaide Hills, SA beaches, Marion Shopping Centre, Flinders Medical Centre, and the South Australian Aquatic and Leisure Centre. Marion Holiday Park is tucked away in suburbia covering 8 acres. 200-year-old red gums are amongst the park, whilst the stunning Sturt creek and Warraparinga wetlands flow through providing serenity for those needing a peaceful getaway. This family-friendly property has everything you need for an ideal holiday experience. 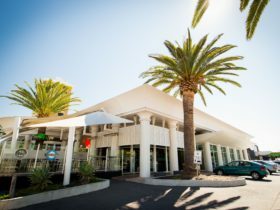 Let the friendly staff at Marion Holiday Park assist you in making your next holiday the most enjoyable one yet! Marion Holiday Park offers both playground and creek facing Two Bedroom Bungalows. The spacious, free standing Bungalows provide guests with all the comforts of home, no need to go without while on holiday. Each bungalow is set amongst beautiful landscaped gardens and has its own private decking area (with outdoor setting). The Two Bedroom Bungalows sleep four people and include one double bed and two single beds, bathroom with spa bath, carport, reverse cycle air conditioner, full kitchen with dishwasher, flat screen television, DVD/CD player and all bedding and towels supplied. The architecturally designed Lagoon Units are perfect for any family. Set along the stunning new solar heated 45 metre Lagoon Pool, these units have everything you need while away from home. The spacious open plan living room and kitchen contain all new furnishings including stylish stainless steel appliances and comfy leather couches. Make the most of the pool with your own private entrance, or sit and relax on the private deck with barbecue. The Lagoon Units sleep up to six people and include two bedrooms – two queen beds and one set of bunks, bathroom and ensuite with spa bath, two split system air conditioners, dishwasher, oven, microwave and gas cook tops, flat screen televisions. 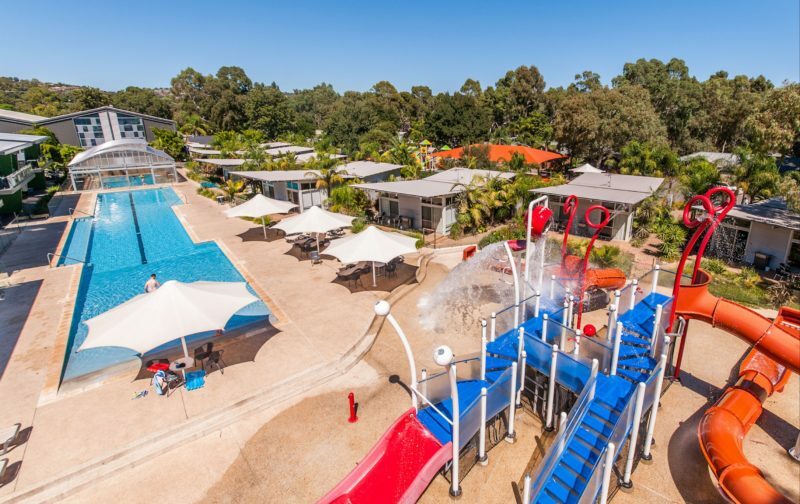 Marion Holiday Park offers great accommodation for families with their beautiful Holiday Units. These units have two bedrooms, with a central lounge and kitchen area. Recently upgraded, the kitchen and lounge area provide you and the family with everything you need. These units are not free standing so you’ll have a friendly neighbour to share the barbecue and outdoor area with. The Holiday Units sleep five to six people and include two bedrooms – one double bed, bedding configuration varies in second bedroom, one bathroom (located through the main bedroom), reverse cycle air conditioner, full kitchen with dishwasher, flat screen television, all bedding and towels supplied. The contemporary, architecturally designed Retreats have all the modern conveniences you need. An Australian design of glass with polished timber floors, suede furnishing, gas log fire and stainless steel kitchen. The Retreats contain two bedrooms and two bathrooms including a luxurious double spa. Relax and enjoy the charming creek setting on your own private decking. These Retreats sleep four people and include gas log fire, three split system air conditioners, television/DVD and entertainment system in lounge, flat screen television in main bedroom, dishwasher, microwave convection cooker and electric cook tops, private deck with barbecue, outdoor setting and delicious continental breakfast welcome basket. Marion Holiday Park’s spacious Three Bedroom Bungalows are perfect for guests with larger numbers. 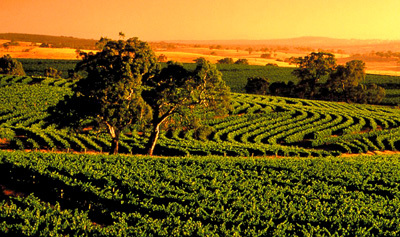 All the Bungalows are located along the charming Sturt Creek and overlook the Warriparinga Wetland Area. Each free standing unit has its own private decking area for you to enjoy, or you can choose to relax in the luxurious double spa. These Bungalows sleep up to six people and include three bedrooms with one king and four singles, bathroom with spa, carport, reverse cycle air conditioner, full modern kitchen with dishwasher, flat screen television and DVD/CD player. Marion Holiday Park also offers fantastic budget accommodation. 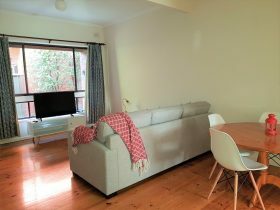 These cosy motel room style Studio Units include a double and single bed all in the main room. Perfect if you are looking for somewhere to rest your head. Everything within these units is located in the main room (except bathroom) and include one double and one single bed, one bathroom, flat screen television, kitchen, sofa and all bedding and towels supplied. Marion Holiday Park has four charming Creekside Villas. Each of the villas looks out over the stunning Sturt Creek and Warriparinga Wetland Area. Enjoy the scenery and abundant bird life on your own private decking area at Marion Holiday Park. The unique villas sleep four to six people and include two bedrooms – one queen bed, bedding configuration varies in second bedroom, private Veranda with barbecue, reverse cycle air conditioner, full kitchen with dishwasher, flat screen television, DVD/CD player, all bedding and towels supplied. Marion Holiday Park also offers fantastic budget accommodation. These cosy motel room style Ensuite Cabins sleep up to five guests. Perfect if you are looking for somewhere to rest your head. Everything within these units is located in the main room (except bathroom and bunk room) and include one double bed and one triple bunk, one bathroom, flat screen television, kitchen, sofa and all bedding and towels supplied. 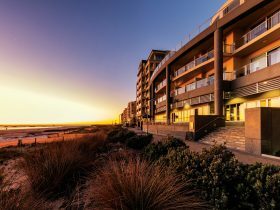 New luxury Deluxe Poolside Apartments are perfect for any family holiday to Adelaide. 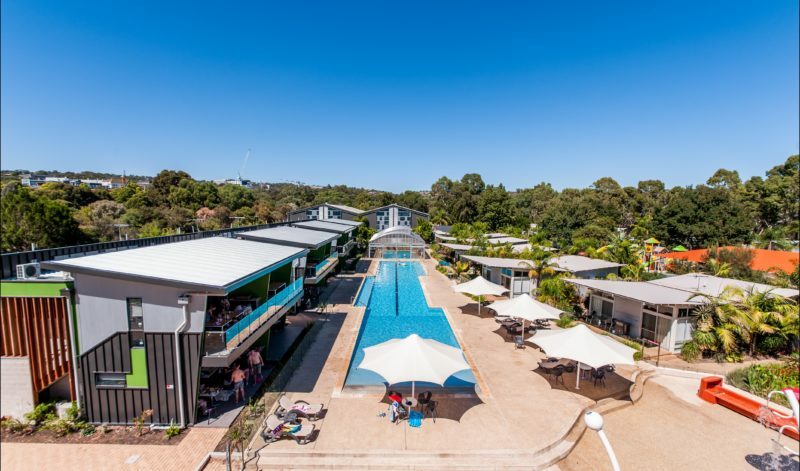 Overlooking our stunning 45 metre lagoon pool, indoor heated pool and water park; these apartments have everything you need while away from home. A stunning architectural design of iron, honed concrete and timber, our new apartments are as striking from the outside as they are inside. All apartments have private pool access, outdoor entertaining area with built in BBQ and wide opening glass sliding doors. Deluxe Poolside Apartments can be booked individually (sleeps 4) OR you can also book a Studio Poolside Apartment so you have the entire 2 storeys (sleeps 8). Perfect for larger families or families holidaying together. New luxury Studio Poolside Apartments are perfect for any family holiday. Overlooking our stunning 45 metre lagoon pool, indoor heated pool and new water park; these apartments have everything you need while away from home. A stunning architectural design of iron, honed concrete and timber, our new apartments are as striking from the outside as they are inside. All apartments have private pool access and outdoor entertaining area with built in BBQ. Studio Poolside Apartments can be booked individually (sleeps 4) OR you can also book a Deluxe Poolside Apartment so you have the entire 2 storeys (sleeps 8), Perfect for larger families or families holidaying together. All accommodation includes linen and towels.